Instructions: Diecut the largest tag from the Album Tags and Accents Die 1x from chipboard and 2x from Gold cardstock. Adhere one gold diecut to the front of the chipboard tag and one to the back. Using the next size die, diecut from black cardstock 2x and adhere one to the front and one to the back of the tag. Stamp the Petite Pansy Frame on Strathmore Bristol Vellum Surface cardstock using VersaMark, sprinkle with gold embossing powder and heat set using the Heat It tool. Color using the Zig Clean Color Real Brush Markers and spritz with Sheer Shimmer Spritz Sparkle and adhere to the front of the tag using foam strips. Adhere Swarovski crystals to the centers of the pansies. Tie a triple loop bow using champagne/gold ribbon and adhere to the top of the tag using a hot glue gun. Adhere a large gold Swarovski crystal to the center of the bow. Using the largest Diamond Basics Die and gold cardstock, diecut half and adhere to the back of the tag as shown to create a pocket. 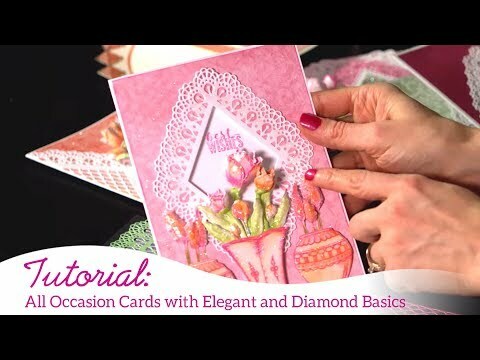 Using the two smallest dies from the same set diecut from black cardstock and adhere to the diamond pocket. Diecut the tag from the paper collection using the Ticket and Tags Die and ink the edges with deep purple ink. Diecut a mat layer from black cardstock and adhere together. Punch a hole in the top, add black ribbon and place in the diamond pocket.